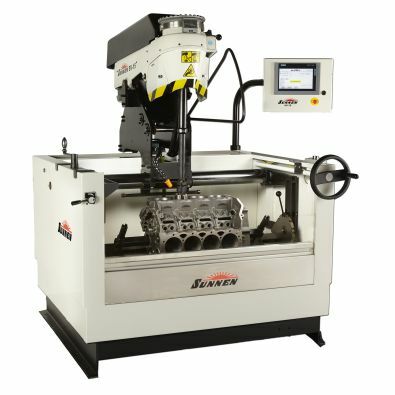 Sunnen's new SV-15 honing machine combines the DNA of the legendary Cylinder King machine with a new 9-inch Siemens touchscreen PLC to provide more features, convenience, and even greater precision and consistency than the "King" of motorsports honing. The multi-lingual control provides a real-time display of the bore shape, allowing the operator to confirm bore straightness and make on-the-fly adjustments to correct taper -- or simply confirm the action of the auto-dwell feature that efficiently concentrates honing action in tight spots. The control automatically switches from roughing cycle to finishing cycle for fast processing with the optimum finish, geometry and crosshatch angle. Precise zero shutoff ensures consistent size control, bore after bore. One hundred setups can be stored in the control, which can be backed up via the control's USB port. The SV-15 is a versatile automatic cylinder hone capable of handling bore diameters from 0.750" to 8" (19-203 mm) and lengths up to 11" (279 mm) for all types of blocks, from single-cylinder and high-performance engines to diesel truck and industrial blocks up to 46" (1168 mm) long. The SV-15's standard multi-position rollover fixture handles inline and most 60°/90° V-type automotive blocks, and the optional CK-6200 clamp kit expands the range of blocks that can be accommodated. The machine's updated safety features now include Siemens Sinamics drives for fastest response times, reduced maintenance and long-term reliability. The honing fluid reservoir/filter system holds 55 gallons (206 liters). Removable settling tanks, screens, filter cartridges (two) and filter status gauge are designed to simplify maintenance.